Please refer to our stock # JDOL-004 when inquiring. 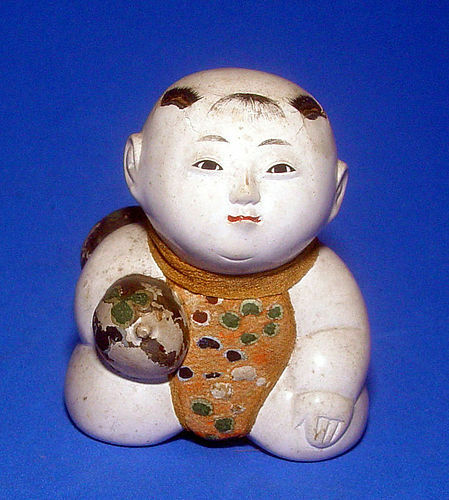 A “Gosho Ningyo” doll of a plump kneeling male child carrying a “hyotan” gourd. The large gourd symbolizes health, vitality, prosperity and immortality. The kneeling boy is wearing a bib with painted accents in white, green, navy blue, brown and gold pigments. There are two ties in the back for the bib. The hyotan (gourd) is also painted in greens, navy-blues, gold and grey of 3-leafed motifs that appear to be paulownia flowers. The eyes, eyebrows and “hair accents are painted in black. The pursed lips are painted in red pigment. The boy has strong, contemplative and intelligent facial features. ORIGIN: Japan—the doll is a gift associated with the Imperial Court and symbolizes good luck and prosperity. DATE: Early 1800’s SIZE: Height – 7cm (2.75 inches) CONDITION: Patina from natural aging. Some pigment chips and pigment wearing in the painted gourd. Very slight shrinkage age cracks. Small tufts of hair missing that sprung from the 2 painted hair accents on both sides of the head. All original, no repairs.